The Trump administration raised the stakes in a trade dispute with China by proposing 10% tariffs on $200 billion of Chinese goods on 10 July 2018, on top of $50 billion of tariffs that were officially imposed on China. The Ministry of Commerce of China immediately responded by warning of similar retaliation. In the latest World Economic Outlook (IMF (2018a) and G-20 Surveillance Note (IMF 2018b), the IMF estimates that the global economy will be 0.5% (or roughly US$430 billion) smaller by 2020 if the various tariffs threatened by the US, China, Europe, Mexico, Japan, and Canada were to be implemented. In the world of global value chains, firms are intertwined in input-output relationships. While tariffs can reduce competition from foreign firms at home, they will also raise the costs of imported inputs for domestic firms, and hence backfire. Domestic consumers and firms that depend heavily on goods produced in a foreign country suffer the most. Moreover, the costs of import tariffs on production can get amplified as tariff-induced increases in input costs are compounded down the supply chains until the final stage when goods are sold to consumers. Thus, the overall economic effect of tariff protection in the world of global value chains is hard to predict. So what are the costs of the trade war? Most of the recent discussions mainly focus on the trade flows and trade policy (Crowley et al. 2017, Bown 2017, 2018, Frankel 2018). In a recent paper (Huang et al. 2018), we study instead firms’ financial market responses to the various announcements in 2018 by both the US and Chinese governments of their intentions to raise tariffs over a comprehensive lists of goods imported from each other. Notes: The red solid curve indicates the S&P 500 index (right scale). The blue dashed curve shows the public interest over trade war as measured by Google Trends (left scale). The information on Google Trends was accessed on 11 July 2018. As Figure 1 illustrates, the sharp fall in the stock market index on 22 March 2018 suggests that the presidential memorandum based on Section 301 of the Investigation of China’s Laws, Policies, Practices, or Actions was a largely unanticipated event. The Dow Jones index dropped by 4.7%, while the S&P 500 index dropped by 4.5% between 21 and 23 March. 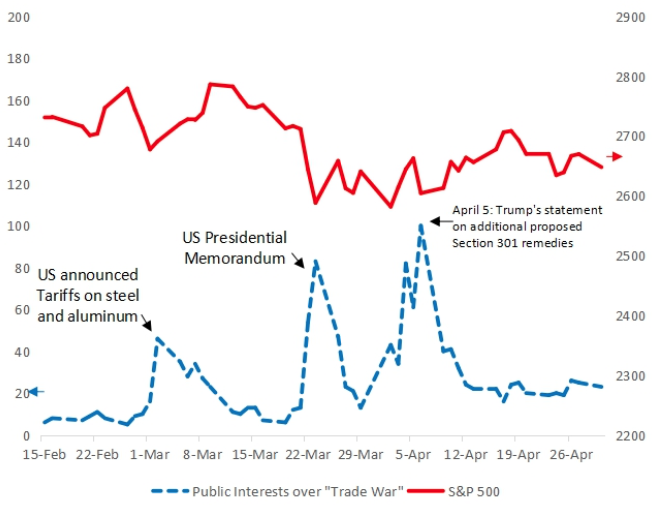 Public interest in the trade war also peaked on 22 March. Similar declines in the S&P 500 index and corresponding spikes in public interests are also observed for the other two announcement dates (3 and 4 April). We exploit this unexpected and abrupt policy announcement by the US government on 22 March 2018, applying an event-study approach to examine publicly listed firms’ market responses to the announcement in both nations. Several new datasets are built to assess a US (Chinese) firm’s direct exposure to imports from and exports to China (US). We also gauge a US firm’s indirect exposure to trade with China through its engagement in global value chains, using US input-output tables and trade data. We find significant heterogeneous responses to the announcement of tariff hikes across listed firms in both countries. Around 22 March 2018, the date when the Trump administration made the first announcement which triggered a sequence of trade-war type events between the two nations, US firms having imports from or exports to China experienced relatively lower stock returns, weaker bond performance, and higher default risks. Specifically, in a three-day window around 22 March, we find that after controlling for standard firm-level characteristics, a 10 percentage-point increase in a firm’s share of sales to China is associated with 0.8% lower average cumulative returns, while firms that directly offshore inputs from China have a 0.8% lower average cumulative return than those that do not. In addition, firms that are more exposed to the trade experienced higher default risks gauged by the growth rate in the implied CDS spread over the same three-day period. We also find that a firm’s indirect exposure through global value chains matters. In particular, an industry that has a 10% higher average share of imports across its upstream industries is associated with a 1.2% lower average cumulative raw return, suggesting significant indirect effects of (perceived) tariff-induced increases in input costs. The effects are equally significant on the Chinese financial market. Chinese listed firms that are more dependent on sales in the US tend to have lower cumulative returns around 22 March. Specifically, after controlling for the standard firm characteristics, a 10 percentage-point increase in the share of exports to the US in total sales (in 2013) is associated with a 0.4% larger drop in the firm’s cumulative return in the three-day event window. However, Chinese firms that import inputs from the US do not experience lower stock returns. We find in both countries’ stock markets the same patterns of heterogeneous firms’ market responses to the 18 June announcement by the US government about additional tariff hikes against Chinese products. Our findings show that whether a firm will win or lose during the US-China trade war depends on the extent of its participation in the global value chains shared by the two countries. While raising the prices of imported goods can transfer profits from foreign to domestic businesses, our study shows that this benefit is far outweighed by the (perceived) increases in input costs.Given the complex structure of US-China trade, most firms in both countries would not be isolated from such negative cost shocks. Bown, C P (2017), “Will the Proposed US Border Tax Provoke WTO Retaliation from Trading Partners?” PIIE Policy Brief 17-11, Peterson Institute for International Economics. Bown, C P (2018), "Trump has announced massive aluminum and steel tariffs. Here are 5 things you need to know," Washington Post. Crowley, M, H Song and N Meng ( 2017), “Protectionist threats jeopardise international trade: Chinese evidence for Trump’s policies”, VoxEU.org, 10 February. Da, Z, J Engelberg and P Gao (2011), “In Search of Attention”, Journal of Finance 66(5), 1461-1499. Frankel, J (2018). “Trump’s on-again, off-again trade war with China”, Jeffrey Frankel's Blog, 31 May. Huang, Y, C Chen, S Liu and H Tang (2018), “Trade Linkages and Firm Value: Evidence from the 2018 US-China ‘Trade War’”. IMF (2018a), “Less Even Expansion, Rising Trade Tensions”, World Economic Outlook Update.